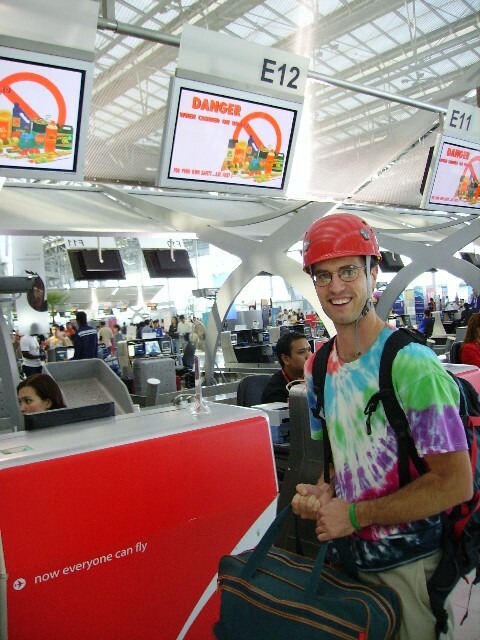 This is me checking in for my flight! I was delayed in Taipei, Taiwan for like a night. It wasn't bad, but I got gypped out of getting a stamp on my passport because I had no VISA to enter the country. So, I didn't really visit a hotel in Taipei for a night, according to the government of Taiwan. According to me, I saw a good bit of the city. I was just glad to be going to Southern Thailand. Oh, and I got to fly with my bro and sis-in-law, since they missed their flight as well. 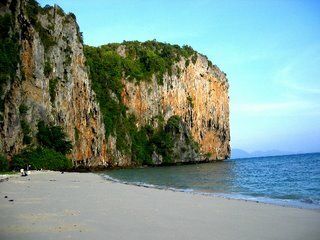 This is the beach on Lao Liang island. It is a small island in the Trang province of Southern Thailand. It is a couple hours south of Phuket. It was beautiful! All the food and lodging was provided, as well as climbing, kayaking and snorkel gear. What a blast! Out of the 6 days I was there I believe that I climbed 5 and snorkeled 4 or so. This is a friend we met over there who works in Yosemite, just a couple hours from me! 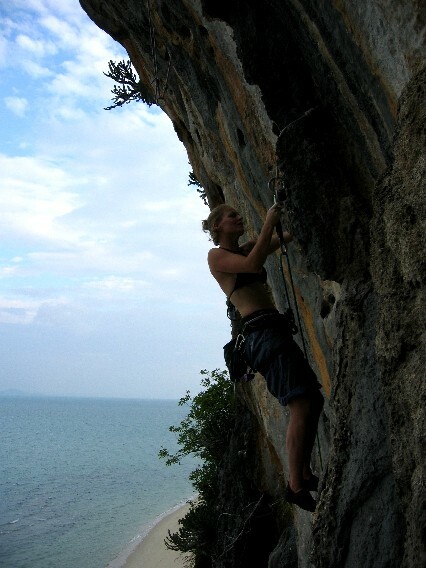 As you can see, rock climbing there is steep! The rock there is limestone and has free-hanging stalactites...really cool to climb! A lot of the formations there are actually too delicate to climb, so the routes that have been set are careful to climb the more sturdy formations. This is me on another portion of the cliff. As you can see, rock climbing wasn't the only diversion there! I did get to snorkel a bit, and was decently impressed. As I have done a fair bit of snorkeling in Micronesia, I think I'm a bit of a snorkeling snob. My little bro and I went on a snorkeling trip and saw some pretty good stuff. Thailand doesn't have near the diversity I saw in Micronesia, but they do have some beautiful things. Wish I had taken an underwater camera, but maybe next time. 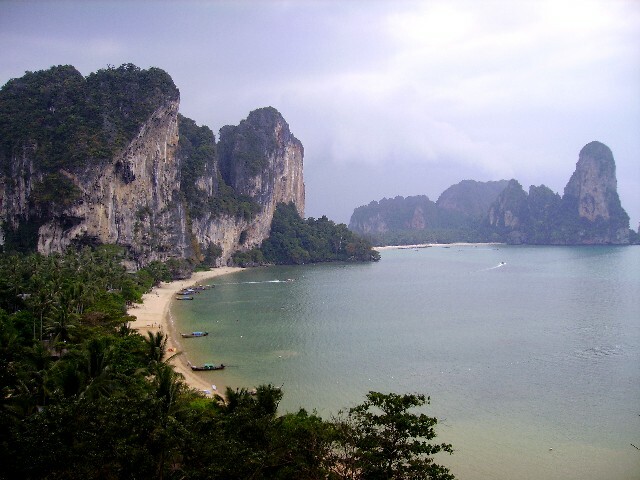 Back on the mainland, we did a trek from Ton Sai beach to Railay beach. Both these beaches were hit pretty bad by the tsunami, Railay beach worse than Ton Sai. They are doing a bit of reconstruction, good to see people haven't been scared off permanently either. 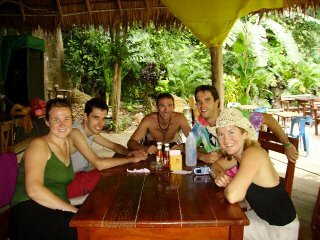 This is a small restaurant in the jungle between the two beaches. Very nice...quiet and great food! Ahhh, a view of Railay (on the right) and Ton Sai beaches. This is only the view of the beaches, wait till you see the rock we were climbing! Yeah, so this was pretty much paradise for me. Warm water, rock climbing, good food, cheap living. I could so be a bum there for uhhh, yeah...FOREVER! 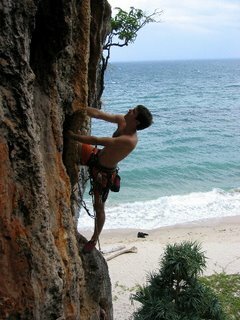 As promised, here is the rock climbing to be had at Cat Wall, the wall from which I took the above beach picture. Pretty cool, eh? I love how the rock flows down in stalactites. Weird, never seen rock like this outside an underground cave before. 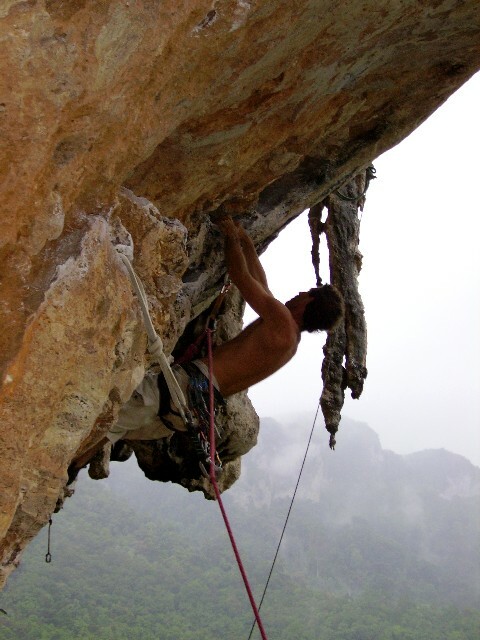 Anyway, this route had such big hand holds that you could swing out with your feet with no problems. Actually quite fun! Well, I must quit the blog thing for now, but I'll leave you with a pic of me falling 40 feet or so into the water. This day was the best day of all. Basically nonstop play the whole day, free soloing (climbing unroped) over deep water. 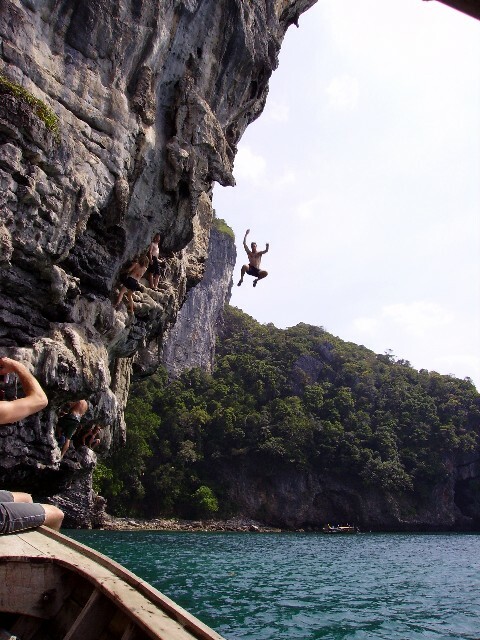 Hence the name "deep water soloing". What a blast! Awesome trip!